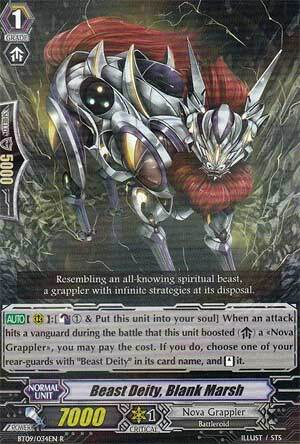 [AUTO](RC):[Counter Blast (1) & Put this unit into your soul] When an attack hits a vanguard during the battle that this unit boosted a «Nova Grappler», you may pay the cost. If you do, choose one of your rear-guards with "Beast Deity" in its card name, and [Stand] it. Blank Marsh is a nice new addition to the Beast Deity archtype. At 7k, it makes a good back row rear guard (and that’s where it’s supposed to be). When it boosts a Nova Grappler attack that hits a vanguard, you can counterblast one, put Blank Marsh into the soul, and stand a Beast Deity. If that sounds familiar, it’s because that is exactly what White Tiger does. The difference is that Marsh is a grade higher and sports 2k more power. That makes all the difference in the world. The skill is a great skill for the Beast Deities, especially with the new Golden Anglet, who gets a boost whenever it stands. Marsh can affect a double boost on Anglet when used in combination with Azure and/or Illuminal Dragon. Of course, so can White Tiger, but using the Tiger means having a column of something like 14 or 15k, whereas Marsh affects a column of 16 to 18k, plus you don’t need to use multiples of a starter. Another reason that Blank Marsh is a good addition is that, because Azure Dragon uses a persona blast, many Beast Deity players are switching to Transmigrating Evolution, Miraioh as their starter. Miraioh searches for grade threes, allowing you to accumulate Dragons faster, but leaving White Tiger out in the cold. Enter Blank Marsh, with better stats and the same skill, and you can have your cake and eat it, too. Rating: 5/5 – Awesome grade one to use to apply pressure with a field full of Beast Deities. Continuing on with the Grade 1/7000 Power units is Beast Deity, Blank Marsh. What makes this unit so unique is that it's practically White Tiger in Grade 1 form.....which really isn't unique, but still an effective skill as it opens up opportunities of getting more attacks in. However, you DO lose Blank Marsh as it has to go back into the Soul as soon as you activate it's skill, so in a sense, it's a -1 as you will have to call another unit out to replace the lost Blank Marsh. With that said, getting that one extra attack in can potentially be a game ender, but it has to be timed almost perfectly to be any effective at all. In short, Blank Marsh is an excellent card for it's Legion, but it's only made for it's Legion, so don't try splashing it into other decks. Rating: 3/5 overall, but a 5/5 in Beast Deity decks. Next Time: You can't Ninpo?! I'll HELP you Ninpo!! !